NOTE 1 Guidance on the impact of piling on archaeology can be found in the English Heritage guidance notes on piling and archaeology . NOTE 2 Attention is drawn to Regulation 22 of The Construction (Design and Management) Regulations 2015 , with regards to health and safety requirements for excavations. The execution of pile foundations should conform to 4.9 and this subclause (6.10). The execution of bored cast-in-place piles should conform to BS EN 1536. NOTE 1 Guidance on the installation of bored cast-in-place concrete piles can be found in the ICE Specification for piling and embedded retaining walls, Sections B3 and C3, Bored cast-in-place piles (SPERW [N3]). NOTE 2 Guidance on the installation of continuous flight auger piles can be found in the ICE Specification for piling and embedded retaining walls, Sections B4 and C4, Piles constructed using continuous flight augers or displacement augers (SPERW [N3]). The execution of driven cast-in-place piles should conform to BS EN 12699. NOTE Guidance on the installation of driven cast-in-place concrete piles can be found in the ICE Specification for piling and embedded retaining walls, Sections B5 and C5, Driven cast-in-place piles (SPERW [N3]). The execution of precast concrete piles should conform to BS EN 12699. NOTE Guidance on the installation of precast concrete piles can be found in the ICE Specification for piling and embedded retaining walls, Sections B2 and C2, Driven pre-cast concrete piles (SPERW [N3]). The execution of steel bearing piles should conform to BS EN 12699. NOTE Guidance on the installation of steel bearing piles can be found in the ICE Specification for piling and embedded retaining walls, Sections B6 and C6, Steel bearing piles (SPERW [N3]). The execution of helical steel piles should conform to A.7. Hard driving of timber piles is likely to broom the butts, crush the tips, and cause cracking. Such damage will lead to a loss of structural strength and might well nullify the effect of preservatives. 6.10.4.4.1 The execution of timber piles should conform to BS EN 12699. 6.10.4.4.2 Where untreated softwood piles form the foundation of a permanent structure, their heads should be cut off below the lowest anticipated ground-water level. If necessary, the pile heads may be extended in concrete or other suitable material. 6.10.4.4.3 The length of any timber piles embedded in a concrete pile cap should be sufficient to ensure full transmission of the applied load. Concrete cover around timber piles should be at least 150 mm and suitable to prevent splitting of the pile. NOTE 1 Guidance on the installation of timber piles can be found in the ICE Specification for piling and embedded retaining walls, Sections B7 and C7 Timber piles (SPERW [N3]). NOTE 2 Guidance on the installation of timber piling can be found in BRE Digest 479 . The execution of micro piles should conform to BS EN 14199. Static pile load tests are performed on test piles in order to determine the resistance versus displacement characteristics of the pile and the surrounding ground. Working piles – piles that are incorporated into the finished works. Pile load tests should be performed under the circumstances identified in BS EN 1997-1:2004+A1:2013, 7.5.1. Investigation tests typically involve loading a sacrificial pile up to its ultimate limit state. Investigation tests have traditionally been known as «preliminary pile tests». 6.11.2.1 Investigation tests should conform to one of the methods described in 6.11.4. 6.11.2.2 Investigation tests may be used to determine the expected performance of a pile type, under specific loading conditions, in the ground conditions relevant to the construction project. 6.11.2.3 At least 1 preliminary pile for every 500 working piles should normally be subjected to an investigation test. 6.11.2.4 Whenever practicable, piles that are to be subjected to investigation tests should be installed before commencement of the main piling works. Working piles that are installed before the results of investigation tests are available should be designed with the larger model factor given in the UK National Annex to BS EN 1997-1:2004+A1:2013, A.3.3.2. 6.11.2.5 Detailed notes should be taken during investigation tests to assist in their subsequent evaluation. 6.11.2.6 Investigation tests should be supervised by people experienced in pile testing. NOTE Guidance on pile capacity testing can be found in the ICE manual of geotechnical engineering (2012), Volume II, Chapter 98 . Control tests typically involve loading a working pile up to a specified load in excess of its serviceability limit state. Control tests have traditionally been known as «working pile tests». 6.11.3.1 Control tests should conform to one of the methods described in 6.11.4. 6.11.3.2 Control tests may be used to determine the performance of a particular pile under working loads, in the ground in which it has been installed. 6.11.3.3 At least 1 working pile for every 100 working piles should normally be subjected to a control test. 6.11.3.4 Detailed notes should be taken during control tests to assist in their subsequent evaluation. 6.11.3.5 Control tests should be supervised by people experienced in pile testing. Static load tests may be used to determine the ultimate static resistance of a single pile and its service performance under static load. Tests that subject the pile to static axially loaded compression should be performed in accordance with the ICE Specification for piling and embedded retaining walls (SPERW [N3]), Sections B15 and C15, Static load testing of piles. Tests that subject the pile to static axially loaded tension should be performed in accordance with the ICE Specification for piling and embedded retaining walls (SPERW [N3]), Sections B15 and C15, Static load testing of piles. Tests that subject the pile to static transversally loaded tension should be performed in accordance with the ICE Specification for piling and embedded retaining walls (SPERW [N3]), Sections B15 and C15, Static load testing of piles. Integrity tests that use thermal integrity profiling should be performed in accordance with ASTM D7949-14. 6.11.5.1.1 Dynamic and rapid load tests may be used to determine the ultimate static resistance of a single pile and its service performance under static load. 6.11.5.1.2 Rate effects (including creep), excess pore water pressures, and inertia effects (due to acceleration) may be present in a dynamic or rapid load test and might differ from what would be expected from an equivalent static load test. The results of dynamic and rapid load tests should be calibrated against static load test results in order to account for these effects. Tests that subject the pile to dynamic loading should be performed in accordance with the ICE Specification for piling and embedded retaining walls (SPERW [N3]), Sections B14 and C14, Dynamic and rapid load testing. 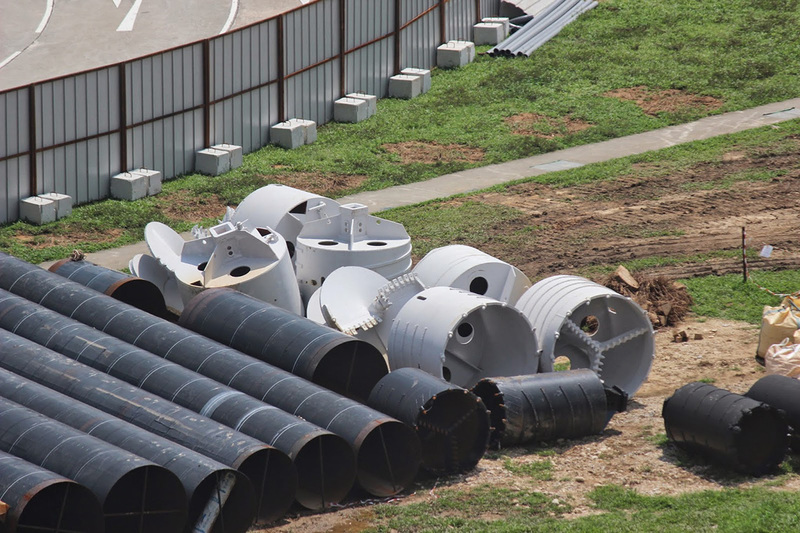 Tests that subject the pile to rapid loading should be performed in accordance with the ICE Specification for piling and embedded retaining walls (SPERW [N3]), Sections B14 and C14, Dynamic and rapid load testing. 6.11.6.1.1 Integrity tests may be used to determine the integrity of cast-in-place piles, barettes, and retaining wall elements after their installation in the ground. NOTE Guidance on pile integrity testing can be found in the ICE manual of geotechnical engineering (2012), Volume II, Chapter 97 . Integrity tests that use the impulse response method should be performed in accordance with the relevant parts of the ICE Specification for piling and embedded retaining walls (SPERW [N3]), Sections B13 and C13, Integrity testing. Integrity tests that use the sonic echo, frequency response, or transient dynamic steady-state vibration method should be performed in accordance with the relevant parts of the ICE Specification for piling and embedded retaining walls (SPERW [N3]), Sections B13 and C13, Integrity testing. Integrity tests that use the cross-hole sonic logging method should be performed in accordance with the relevant parts of the ICE Specification for piling and embedded retaining walls (SPERW [N3]), Sections B13 and C13, Integrity testing. The construction of a pile foundation should be supervised by an appropriately qualified and experienced person. Monitoring of helical steel piles should conform to A.8. 6.12.3.1 If the design of the pile foundation relies upon a dewatering system, maintenance of that system should be ensured. 6.12.3.2 Where bolted connections to piles are used, maintenance of those connections should be ensured. The Ground Investigation Report for a pile foundation should conform to 4.12.1. 6.13.3.1 The Geotechnical Feedback Report for a pile foundation should conform to 4.12.3 and this clause (6.13.3). BS EN 1997-1:2004+A1:2013, 7.5.4, should be included in the Geotechnical Feedback Report. record drawings showing the piles as constructed. 6.13.3.4 The Geotechnical Feedback Report should be prepared jointly by the pile designer and piling contractor. 6.13.3.5 The Geotechnical Feedback Report for a helical pile foundation should also conform to A.9.3.